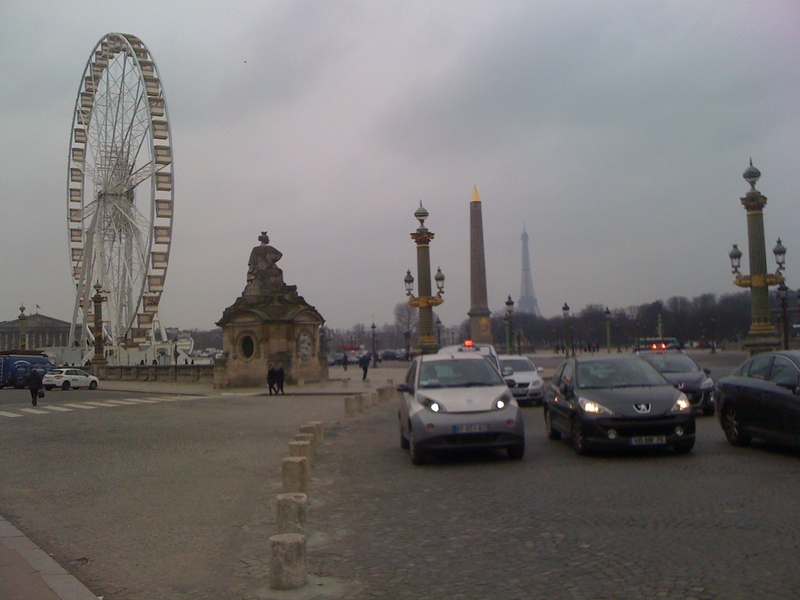 ………..of my January Paris trip, was the last day. Because I had been unwell I didn’t feel as if I had given enough time to Paris, given her as much attention as she deserves. …. there again I never do. So this last day was my opportunity to get into the heart of Paris again, to make my peace with her to absorb her atmosphere . So, feeling much recovered I left Lizzie behind and set off on the 96 bus, which takes you through the Marais and then past the Hotel de Ville over the bridge to the left bank and onward. I had no particular plan in mind. I just vaguely thought I would go in the direction of the Eiffel Tower and see what I discovered. 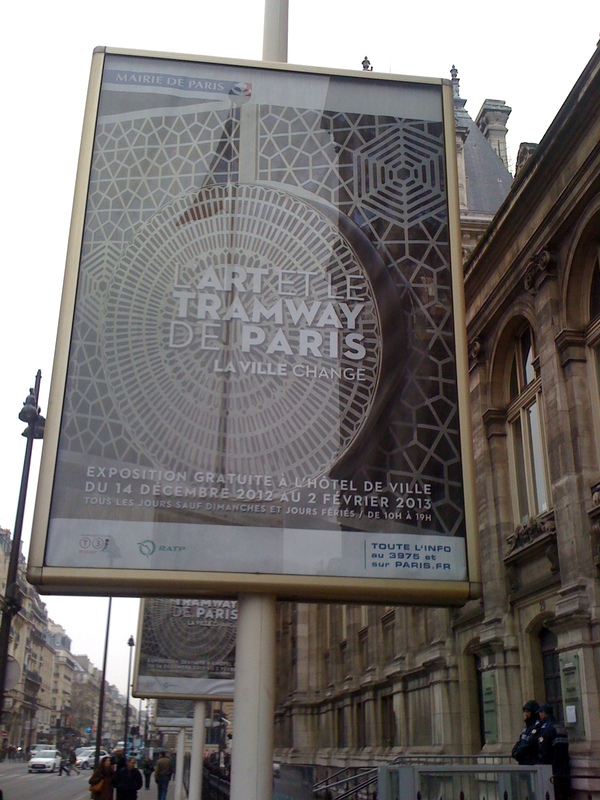 Spotting this photographic exhibition at the Hotel de Ville, I hopped off the bus and visited. 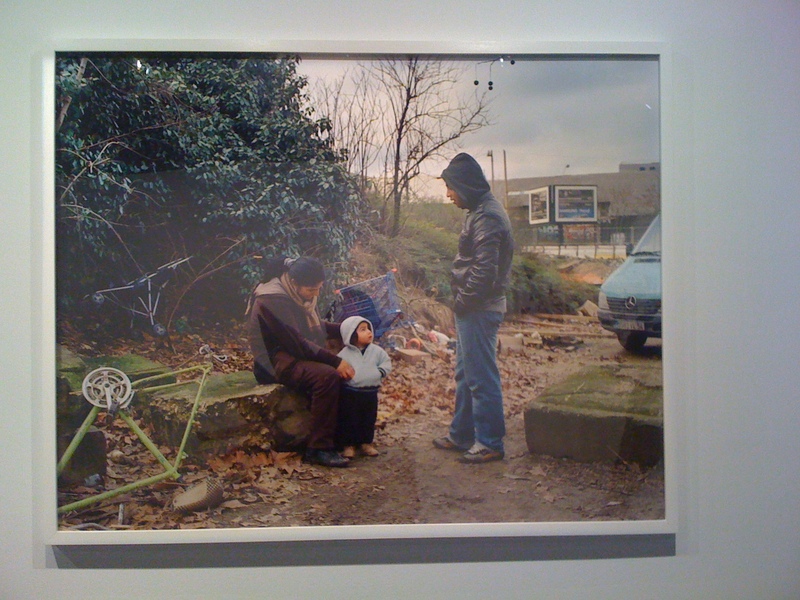 I recognised some of the photos, but could not find out who the artist and photographer was. A couple of years ago I was on a self guided walk through Belville (as you do!!) 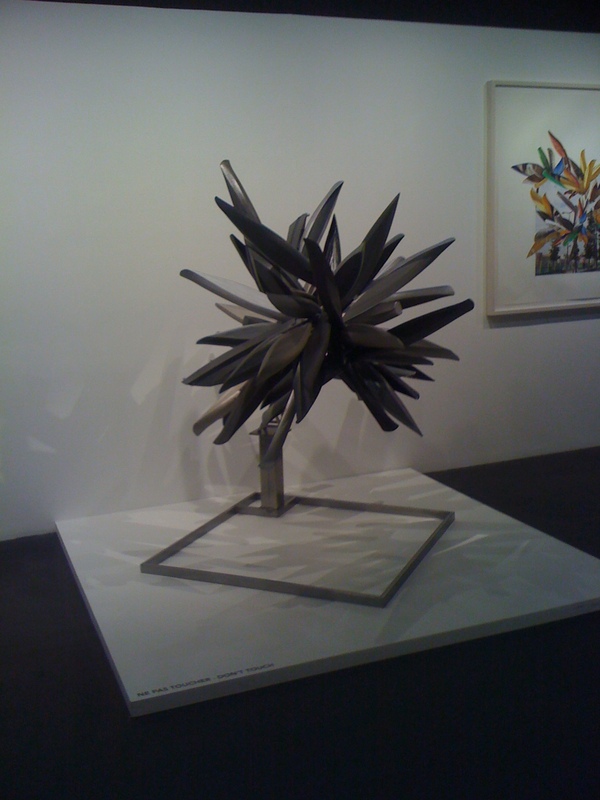 and I stumbled across an exhibition of his work. 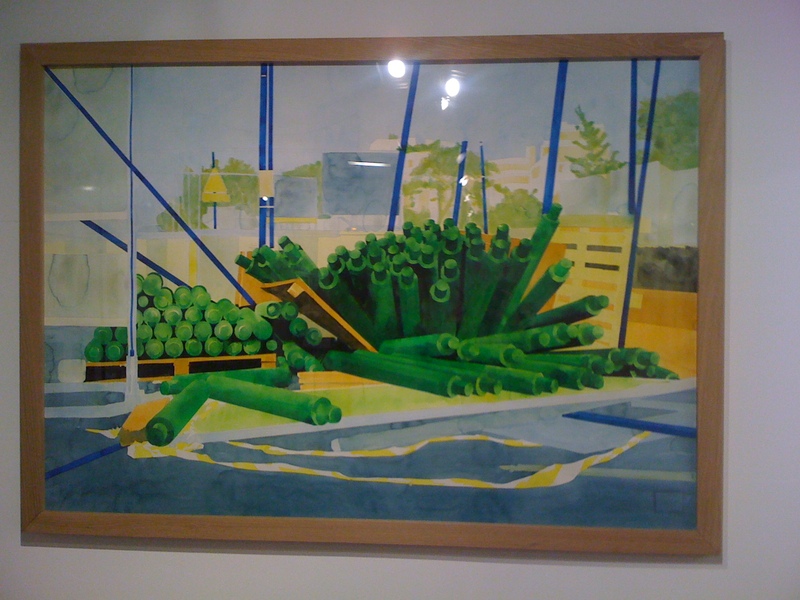 The paintings and photographs were all of urban scenes. 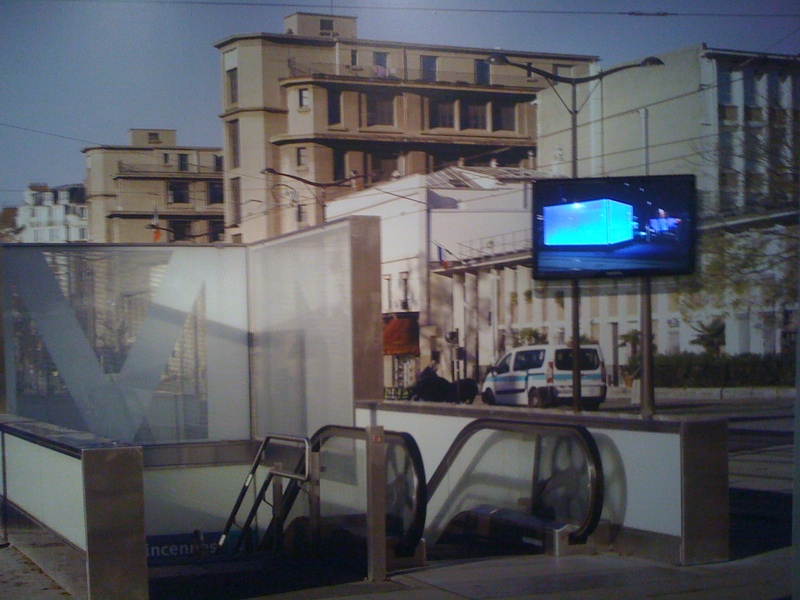 This is a huge mural of the metro entrance at Vincennes, with a TV and pictures of trams running on a loop. I am always amazed how mundane pictures can be made to look interesting by how they are presented. Continuing my day I then hopped on metro line one to Place de la Concorde to visit another of my January “must do’s” The Waterlilles at the Orangerie. Coming up from the metro at Concorde, I am always stunned by the view from the corner and the glimpse of the Eiffel tower in the background. 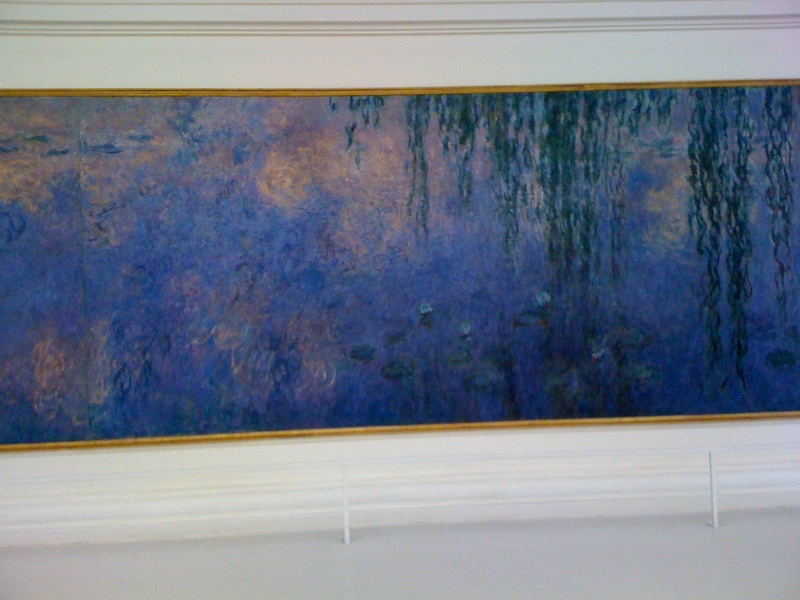 At the Orangerie, I sit and meditate for about 45 minutes in front of Monets Waterlillies. I am even more in awe now I know he painted them whilst he was almost blind. People come and go. Some just wander through fast, obviously not that impressed, just ticking it off a list. Some sit and gaze, getting up to look closely in curiosity. A man with a beret sits besides me and I can tell from his sigh and his demeanour that he finds the paintings as spiritually uplifting as I do and we sit in silence for long while, letting the tranquillity of the installation wash over us. I never view the rest of the exhibition. It would break the spell and I wander out to find Rodins Kiss outside, which I have never noticed before. I walk along the riverside and it is freezing cold, so I hop on another bus, the 69 this time and ride around the left bank. (navigos are so useful!) but get off on Rue de Bac, when a car blocking the street causes the traffic to come to a stop, with the driver nowhere to be seen!. Typically Paris. 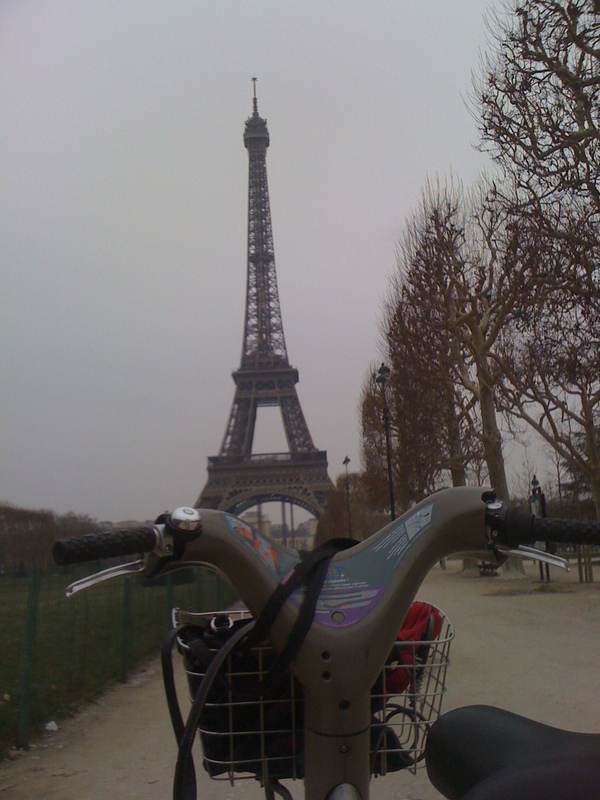 Again, the best way to continue my tour is by velib, so off I go through St Germain the 6th and 7th arrondissements towards the Eiffel tower taking in Invallides and rue Cler as I go. By now it is really really cold and just beginning to snow and the problem with riding a bike is that although I have ski gloves on and another pair underneath my fingers are beginning to freeze. So I stop on Rue St Dominique for a hot chocolate and a pastry ( what else!) I browse around the lovely shops there before hopping back on the velib and continue my journey home. By this time it is SO cold, that to take my gloves off to consult my map immediately freezes my hands so I call in the church of St Germain des Pres just to look at my map! I notice a man finding the east before he starts to pray, so I assume he is Muslim and I think is is so good that he feels he can pray in a Christian church. I wonder if he is praying for peace with the situation in Mali and Algeria today. I catch the 96 bus from opposite the church and as I ride back to the apartment, it is snowing hard now and Paris looks beautiful with her white blanket, the bare trees pretty with their frosting. I know I do not want to leave here and desperately want to come back alone soon!. Previous post ← WHO LIVES IN AN APARTMENT LIKE THIS? What a perfect day Denise, snow and all! This is how I want to be in Paris, no plans or schedules, just walk or ride a bus and discover as I go, stopping where I feel like it at the moment. We were never able to visit l’Orangerie, it was undergoing renovations so this is one I need to see for sure. I could feel the cold from your description and the photos, that hot chocolate must have been heaven! Sylvia, L’Orangerie or rather the waterlillies. are part of my pilgrimage to Paris. I don’t know why they have this wonderful calmimng effect on me. In winter there is no queue and it is a nice shelter from the cold. They have stopped photographs, but I discreetly sneaked this one with my iphone. This was a great post, really enjoyed your thoughts here. Oh, I love this post! Your love of Paris and why you love it shine through with every sentence. That is the beauty of Paris ~ you don’t have to DO anything to enjoy it, you just have to be there and let it seep into your soul. What a perfect day, cold and snow included (although I still marvel at your bravery at biking in Paris, especially in the winter!!). I hope you get to go back soon……. Looking at flights as we speak, Jo. Although Michael wants some “winter sun” and is looking at Palma Mallorca in March. I am loathe to leave him because I will be a way nearly a month in May. Maybe just sneak a weekend in Paris or maybe just dreaming! I have gone to Paris in January for the past few years and this is the first time I have had snow and such cold weather. It is lovely but causes travel chaos at the airport. I was impresses that the Paris buses kept runnng. They would cancel them here. “Health and safety” Ironically on Saturday morning the bus was deserted! 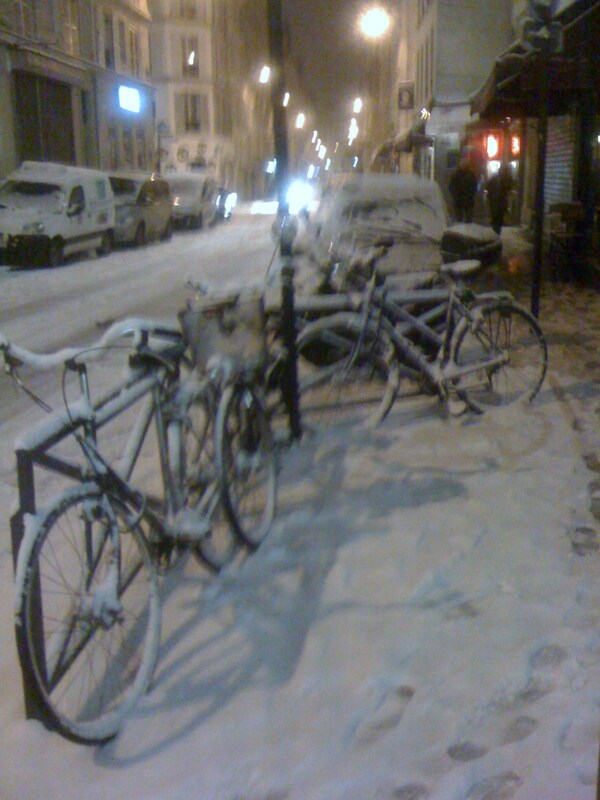 Parisiens stay home in the snow! Lovely day for you Denise – not so sure I would have liked to tolerate the snow and cold as you did but it seems that it was a perfect day for you – I didn’t realize the Rodin statue was there at Concorde either – has it always been there I wonder? I’ll have to pay more attention next time. Thanks for sharing your thoughts and your “best day” with us – hope you get to return solo again soon! Thermals and layers!!! I have discovered the answer to cold weather Sandy. I learnt this on tripadvisor. No more bulky jumpers just thermals and several thin layers are much warmer….. and show off the Svelte figure!! LOL!….not! As to my hands. I usually use those chemical hand warmers that activate when exposed to air but had left them in the apartment. I also discovered when I hurt my back recently that those stick on warming patches that are meant to be for injured joints are great for keeping you warm in the cold too. I never noticed the Rodin statue before either. I wonder if they have recently put it outside L’Orangerie when they were renovating the Rodin museum? Yes I was so sorry to miss you. 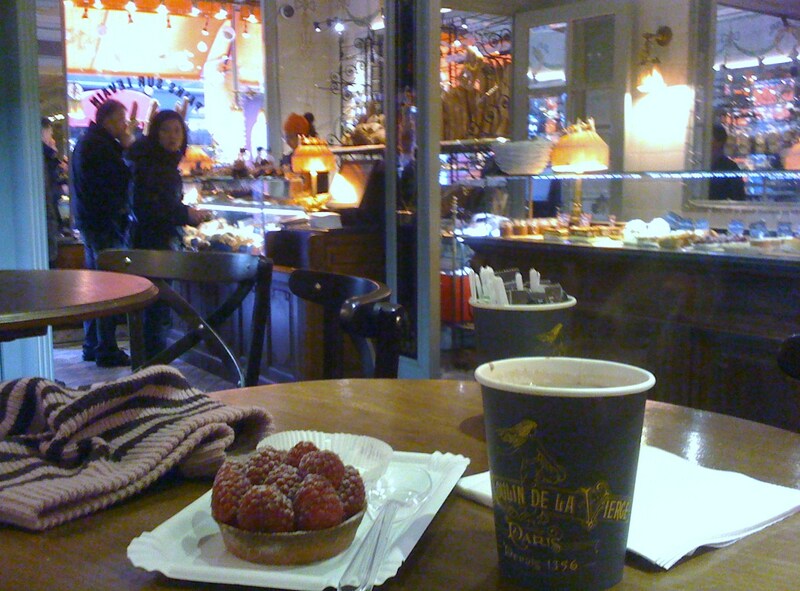 I will certainly book a coffee in advance next time I drop by Paris….and I will bring you some hand warmers. Always useful to keep in your bag! Lovely post Denise, I’m glad you managed to get one day of “me time”. 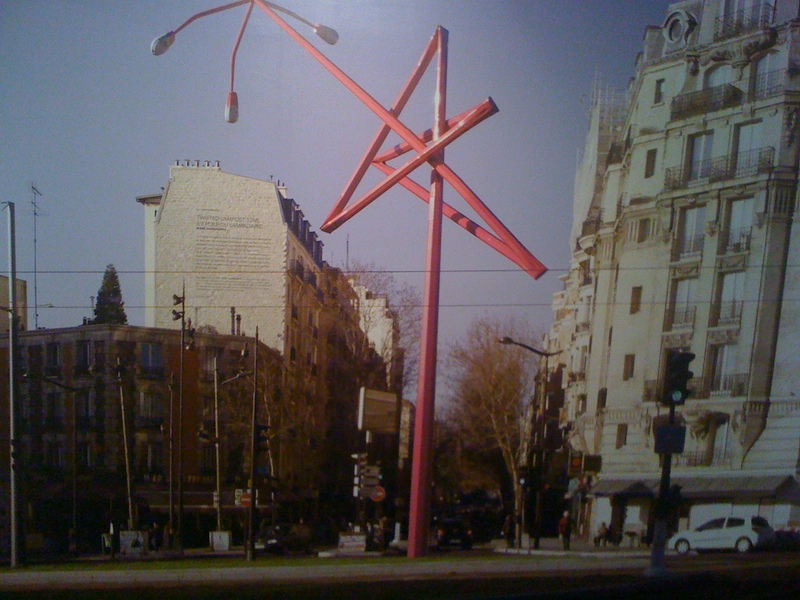 david and I also enjoyed the exhibitio0n at the Hotel de Ville. We went in to escape the cold and were impressed with the way it was displayed. I think Rodin’s sculpture has been moved to Concorde while renovation work has been carried out at the Musee de Rodin. I loved Paris in the winter snow, not so sure that David really enjoyed it. I don’t think we will be visiting in the winter again, although I may get a solo couple of days next winter! Sorry that David was not as impressed, unfortunate that he had to experience the worst weather in years. …but maybe that gives you an excuse to go by yourself. You were lucky to see so much snow in Paris. ( although not so lucky to get stranded at the airport!) This seems like unusual weather. Previously I have only ever seen a light sprinkling which dissapears very quickly, not really what I would call “snow” This explains why everybody is going mad with their cameras. Hope you got some good pictures, you are such a better photographer than me. I can never get my head round the fact that when it is freezing here you may be having a heatwave. Thanks for your nice comments. Glad you enjoyed the post. Hi Denise.. this is a great post! You know I still haven’t been to the Orangerie!! I must put that on my to do list!! Would love to see Monet’s waterlillies! Hi Denise.. what a great post!! You know I have never been the Orangerie!! I must put this on my to do list in Paris!! I would love to see Monet’s WaterLillies!! We will have to make a date Roniece! Denise, you write wonderfully about Paris. Your love of the city is so evident in your musings. 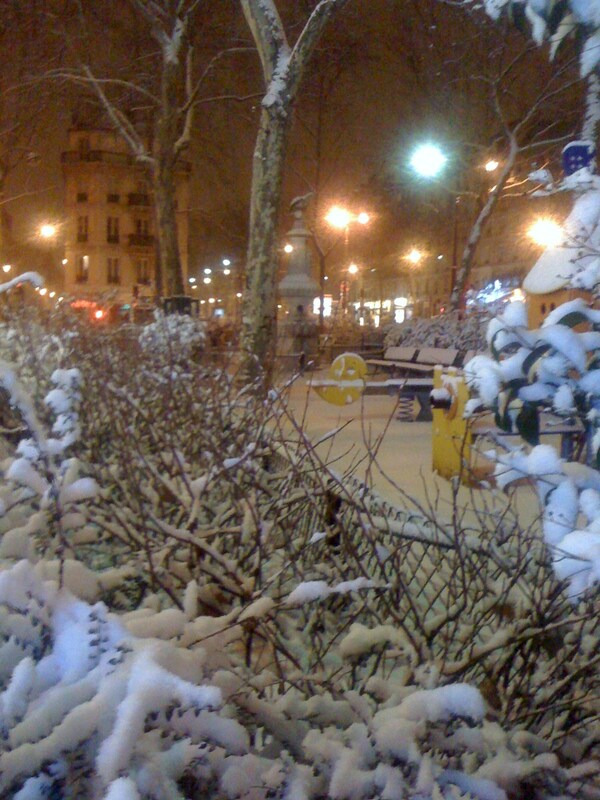 I feel so lucky to have finally seen Paris in the snow…a long held wish. Yes, even though I hate snow, it was interesting to see it in Paris and somehow it did not seem as bad as at home. Maybe thats because it hadn’t got to the dirty slushy stage and made the world as we know it come to a standstill like it does at home! Thanks for your kind words…..I have inspiration! Hi Dawn. So nice to see you on this trip. Sorry we missed Jordan. Just a plug for your blog which says it much better than I can.